Margins are notoriously tight and hidden coverage is, and will likely continue to be, elusive. Per a recent Navigant study, the average operating margin for health systems in 2017 was 2.56%. From 2015 to 2017 (the two full years that followed the ACA coverage expansion), operating margins dropped by 38.7%. Staying in the black is a continual challenge for hospitals and health systems due to various industry trends, such as increased denials, a changing payer mix and rising uncompensated care. According to Moody’s data, revenue at nonprofit hospitals continues to lag behind expenses. In 2016, costs grew 7.1%, while revenue grew 6.1%; in 2017, costs grew 5.7%, while revenue grew 4.6%. These stats indicate hospitals must explore every avenue to maximize earning potential. That includes digging deeper to find missed insurance coverage for additional payment opportunities. The reasons below shed light on why that’s necessary and beneficial. Check out our infographic to learn how you get on the right path to maximizing recoveries. Using existing, internal systems and processes, most hospitals and health systems can find up to 99% of missed coverage. However, that remaining 1% — which would otherwise stay hidden and chalked up to bad debt — can be the difference between being in the red or black. Capturing this hard-to-find coverage requires the backing of a comprehensive insurance discovery solution. 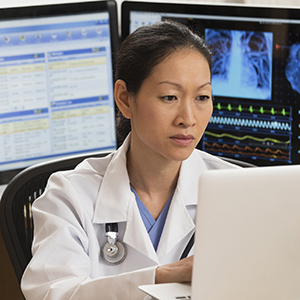 With robust data and analytics, an external partner can search beyond the surface for coverage — going deeper into complex payer scenarios. The majority of missed coverage comes from self-pay accounts. And while recovering an additional .5% to boost your margin can be significant to your organization’s overall financial health, finding up to a full 1% is optimal. In order to remain competitive – and in some cases, keep doors open – hospitals and health systems need to ensure all their earned revenue becomes paid revenue. Going the extra mile to implement an insurance discovery solution that optimizes every opportunity to find hidden coverage can pay dividends in the long run. Quick tip: Configurable work queues allow multiple users to efficiently manage results — including accounts from multiple hospital locations in a single work list. TransUnion Healthcare’s insurance discovery solutions dig deeper to find hard-to-find coverage — leading to a healthier bottom line. Learn how to get on the right path to recoveries in our animated infographic.